Surf kayaking can be an exhilarating and spectacular sport. The Thames may be tidal, but it rather lacks decent surf breaks. This doesn’t deter many London kayakers, who head off to the coast to take part in surf kayaking, playing and competing in the waves and surf. 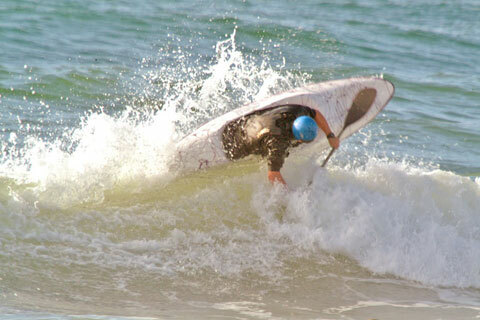 There are surf kayaking competitions at some of the best surf breaks around the country, with opportunities for newcomers as well as the experienced paddlers. Almost any kayak can be used, but serious surf kayakers will invest in special surf kayaks. Surf kayakers do need to be especially aware of surfers and people in the water. A surfing kayak can travel hard and fast so make sure you can control your boat, or choose an empty part of the beach to practice on. For more information check out the following links. There are over 60 canoe clubs in London. Some practice specific types of kayaking and canoeing, whilst others have a wide range of boats, and members who are interested in different types of canoeing. London has over 100 miles of waterways, making canoe trips and kayak tours a great way to explore the city. Messing around on the water is fun, but it is not without risk. Even good swimmers can struggle in cold water, and many of London’s waterways have steep, walled in banks that are not easy to scale. Here’s our top tips for canoe safety and keeping safe on the water. Whilst ever effort has been made to ensure that the information on this website is accurate, errors or omissions may occur. If you wish to comment on any content which you feel is inaccurate, please get in touch via the contact page. Canoe London is a not-for-profit website designed to promote kayaking, canoeing and stand up paddleboarding in London. Site design and content by Ian Tokelove. © 2019 Canoe London. All rights reserved.